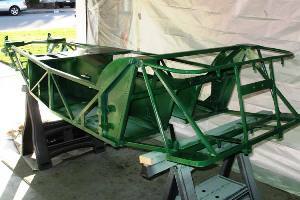 The chassis is painted. It's not quite done, but it has a full two coats of primer, and a practice coat of 2K urethane enamel in British Racing Green. The color coat might not have started out as practice, but that's how we see it now, and we'll get into the reasons for that in a minute. 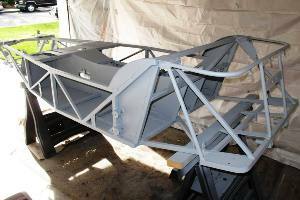 As things currently stand, the final color coat will happen in a week or two, weather dependent as always. Bare metal and water, together. On purpose. 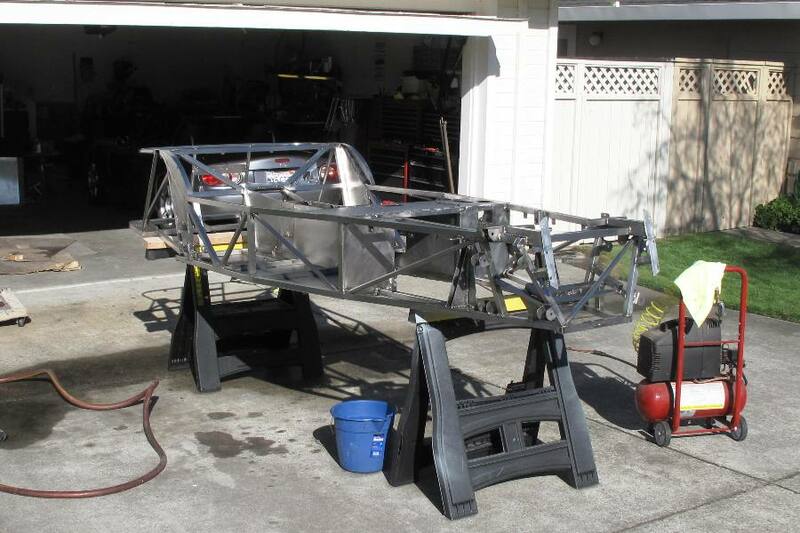 We started off the weekend by washing the frame in soap and water. This is universally recommended by paint manufacturers prior to painting to remove any oil and oily-based substances, even though it seems somehow wildly inappropriate for bare, unprotected steel. 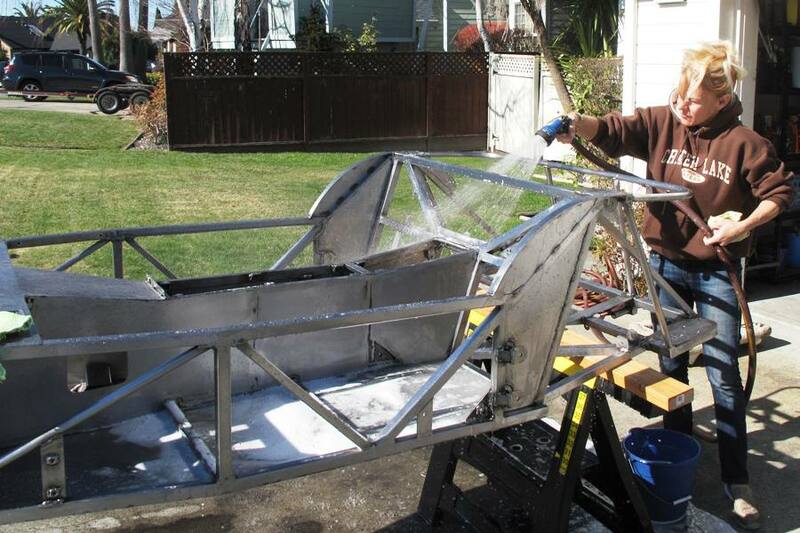 But based on the assumption that paint manufacturers know more than we do, at least about painting, and possibly about other things as well, we went ahead and soaped up the chassis, rinsed it thoroughly, and spent the next two hours with the air gun trying to dry it out. 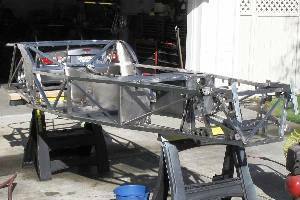 With all of those steel tubes and sheets intersecting at odd angles, the chassis has lots of nooks and crannies. These are basically hiding places for water. Water seeks them out, and is stubborn about leaving. Water also seeks out any holes you may have drilled in tubes, like for instance rivet holes, so we learned something on this build, that it's a good idea to wait until after you paint to drill holes in tubes. Otherwise you'll end up drilling even more holes, in the bottoms of said tubes to let the water drain out. After washing, the frame was as clean and sparkly as it's ever been since we started this whole giant mess, so we went ahead and etched it with something called Prep & Ready. We're still not 100 percent sure what etching is, but it's definitely supposed to be good. Unfortunately it's not pretty. It turned all of our shiny steel several shades of dull gray, with panels dripping streaks of brown or bronze that had to be some kind of zinc residue. The overall effect was uncannily similar to something you might see on the side of a dumpster in a back alley. But the chassis was ready, so we got our paint guns and hooked up our compressor. We were nervous going in, our main concern being coverage. Getting primer into all of the aforementioned nooks and crannies seemed like a long shot. Fortunately that turned out not to be a major issue, because atomized paint shot from a gun seems to find its way onto everything, whether you wanted paint on it or not. To make sure that didn't include other cars or car parts in the garage, we constructed a makeshift paint booth out of drop cloths, which were not actually cloth but more of a paper-based material. Our second concern was about painting color directly over primer. This concern was not so much about adhesion as the quality of the finish. Here our concerns were totally justified. Two coats of primer went on easily, and left a nice protective finish, but not an especially smooth one. 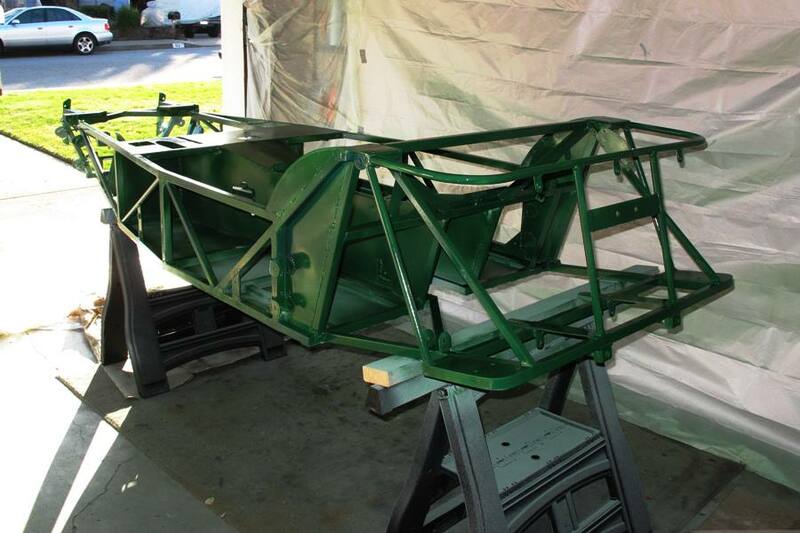 Real painters would have looked at the chassis and said that's it, we're done. Let it dry, sand it smooth, and paint the color next week. Needless to say, we are not real painters. And we don't have anywhere near that kind of patience. So we mixed up our one quart of 2K BRG urethane. 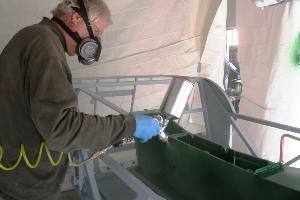 We started with the transmission tunnel, having learned from our previous foray into chassis painting that if you paint the outer tubes first, that paint will get smeared on your clothes when you lean over it to shoot stuff in the middle. Right away we started getting that uneasy feeling that things were not working as planned. The color looked really cool, no question. The paint, however, did not, taking the already rough surface of the primer and turning it into a pebbly green landscape that wasn't even all that shiny. Despite this we persevered, our usual flawed optimism convincing us that everything would turn out okay, until we ran out of green paint. It turns out that a single quart of 2K urethane is almost enough for an initial coat of paint on a Locost chassis, but not quite, and also that paint with this particular opacity is going to need at least two coats, and probably three. Definitely at least one, which wasn't the case everywhere, a few tubes being green on only two or three sides, instead of the requisite four. A little disappointing, to say the least. The frame looks okay in pictures, if you're careful about the angles and lighting. And a few parts of the chassis actually look good, the paint all glossy and smooth, although these bright spots probably account for 1% of the total surface area. We thought about just sucking it up and living with it. 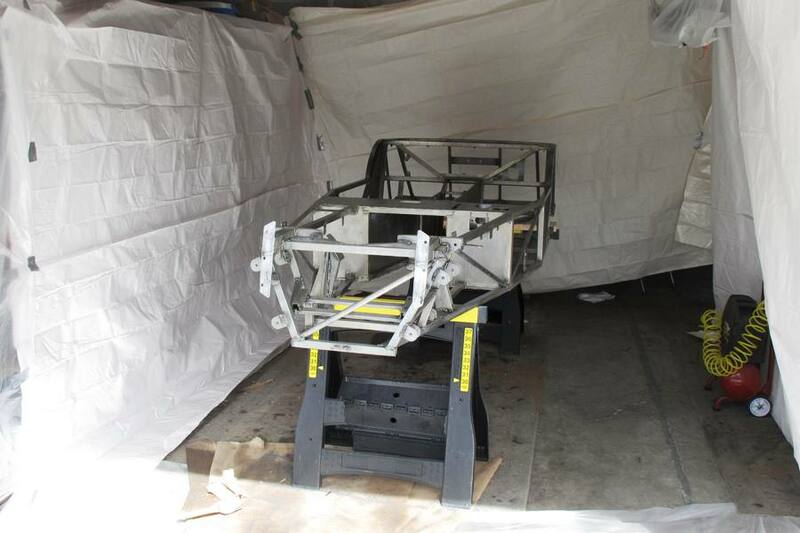 Most of the chassis will be covered with bodywork anyway. But then we'd never be able to take the hood off in public, thereby exposing all of the unsightly tubes and panels in the engine bay. So we've resigned to paint the thing again. Next time of course will be different, because it always is, and because over the next week or two we're going to sand the frame back to silky smoothness. 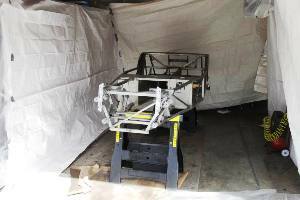 Despite our difficulties we're looking at this past week's painting efforts as a positive step, rather than a setback, because we learned something, and because despite its ugliness, our chassis is now once and forever protected from the elements, and will never rust again. Ever. Unless the paint gets chipped or scratched and we're too lazy to touch it up. But we're a long way from that ever happening. A month at least. This arcilte keeps it real, no doubt.